e.g., flight data, high counts, and earliest/latest dates can be seen. Identification Tips: Move the cursor over the image, or tap the image if using a mobile device, to reveal ID Tips. Note: these identification tips apply specifically to mature males; features may differ in immature males and in females. distribution Roughly the eastern half of the state, and highly scattered elsewhere to the west. Specifically, nearly throughout the Coastal Plain (though perhaps absent in some Tidewater counties), the eastern third of the Piedmont, and very sparingly westward to include the extreme southern mountains. Presumed absent from the central and northern mountains; however, presumed to occur as a rarity in the western Piedmont counties. abundance Common in the Sandhills, but mostly uncommon elsewhere in the southern half of the Coastal Plain (though locally common in Carteret County). Rare to uncommon in the northern Coastal Plain, and perhaps absent close to the northern coast. Rare in the eastern Piedmont, and very rare at best elsewhere in the Piedmont and southern mountains. 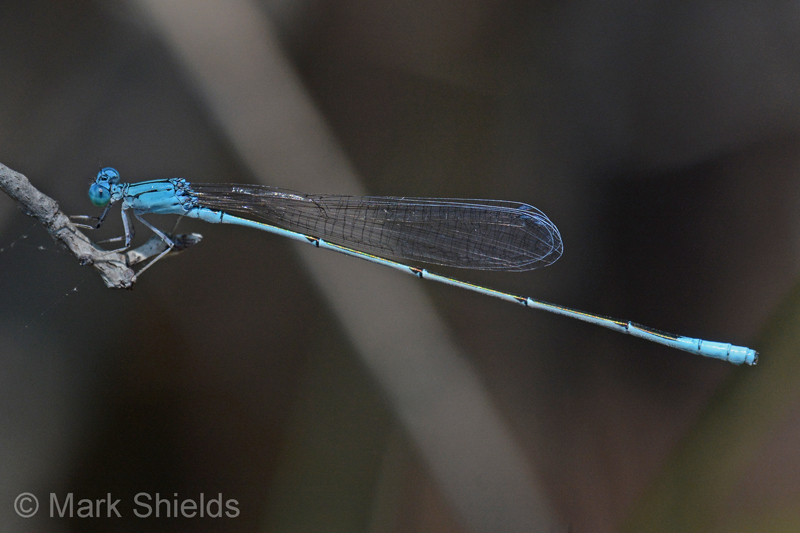 flight A shortened flight for a bluet, seemingly not occurring after mid-summer. In the Coastal Plain, it occurs from mid-April only to late July, and in the Piedmont from mid-May to early August. The only date record available for the mountains is for late June. habitat Sand-bottomed ponds and lakes, almost always in wooded areas and with shrubby margins. comments Our two highest counts are now from the southeastern coastal area. There are also several sizable single-day counts from the Sandhills. Despite there being at least 15 county records west of the Fall Line, there are just two recent reports from this large area, from Mecklenburg and Wake counties. The species is fairly distinctive in its "skinny" look, and thus it has possibly declined in the Piedmont. New records for the Piedmont, and the northern half of the Coastal Plain, are greatly needed. Comment: Carteret, 2017-05-21, - Patsy Pond. Most numerous population in one spot I've ever seen.